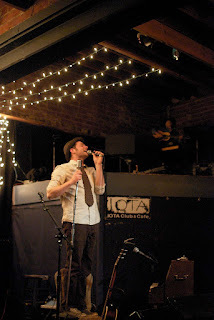 I'll confess that I went into the David Ford show at Iota this past Sunday not knowing quite what to expect. I had seen the viral "Go To Hell" video that had become something of a YouTube sensation. I had given his new album, Let the Hard Times Roll, a listen, finding it to be a pleasant record somewhere between David Gray's melancholy soul and Damien Rice's hardscrabble folk. And yet, I still didn't quite have a good feel for what the show might be like. More on that in a bit. 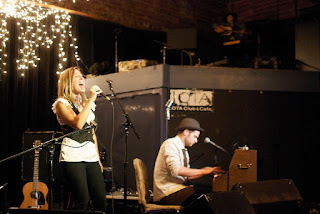 Opening for David this night was Jeanne Jolly, a striking North Carolinian singer/songwriter whose voice carried hints of Linda Rondstadt's early power with the delicate lilt of Alison Krauss. Along with original numbers which included a touching tribute to a newlywed brother in attendance, Jeanne (pronounced Jean) covered Whitesnake's "Here I Go Again" and was joined onstage by David for a set closing rendition of Tom Waits' "Downtown Train". After a short hiatus, David took the stage solo. I was vaguely puzzled, as there were enough instruments onstage for an Edward Sharpe or Polyphonic Spree set. David picked up a trio of noise-making implements and launched into a set that was decidedly more furious than his album or his video would have indicated. He had a bit of blue-eyed soul to his voice, and more than a little of that prototypically British folk angst. He also had an edge, a dynamism borne of necessity, imagination and probably more than a touch of insecurity. He sounded like he had something to prove as he railed about loving the wrong woman in a number entitled "She's Not the One", which is the first and only love song about Margaret Thatcher that I've heard. He explored heartbreak on both a personal and national level with "Stephen", a lament about the 2009 murder of a police officer in Northern Ireland that was the first in more than a decade. All of these words simply can't capture the spirit of what David was able to do, through sheer manic effort, on stage by himself. His versatility and virtuosic command, not only of the multiple instruments onstage but also of the looping pedal, enabled him to simulate how a full band might sound supporting him. Andrew Bird, Liam Finn and Theresa Andersson, all masters of the looping pedal, could learn a thing or four from him. 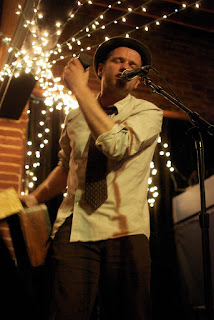 David restlessly prowls the stage like an errant Kaiser Chief or a lost Campesino! His voice turned unexpectedly guttural as he exorcised his demons, musical and otherwise, on the stage at Iota that night. I was exhausted watching him. The finale of the show, not surprisingly, was similarly unexpected. David advised the audience that he didn't do encores, that he didn't believe in playing that game, especially given the size of Iota. He was going to lay whatever he had to give out there in a single set, with a special request of the audience at its conclusion. He drew the crowd's attention to a bell, the kind you might find at a hotel front desk, sitting on his piano. He told the audience he would ring that bell once at the conclusion of his last song, at which point he wanted the audience to put all their energy into a single clap. Not a single round of applause...one solitary clap. He would then walk off the stage in complete silence until he was safely out of view, at which point the audience could applaud in whatever manner they saw fit. Strangely, agonizingly and a bit surprisingly, it worked. David rang the bell, the audience gave it their all in a single clap, and then David walked offstage and out of sight. The crowd then exploded in appreciation of a set that, at least for me, is an early contender for best concert of the year. My advice to you is to find a David Ford solo show as soon as you can. I imagine that word of mouth of his live show and album sales will afford him the luxury of bringing a few more musicians with him the next time he mounts a tour, should he decide to shed his mantle as a one-man band. No number of accompanying musicians could replicate the frenetic energy David expended onstage, one man desperately tilting at musical windmills.